Academic publishing: What’s the delay? One of the more popular topics that we’ve covered so far at Post Academic is academic publishing. About a month ago, I wrote about what I called the “time lag problem” in academic publishing, and recounted a frustrating experience I had trying to place an article that ended up on the scrap heap after a year-and-a-half in review purgatory. (Actually, it would be kind of absurdly hilarious, if it hadn’t happened to me!) As we mentioned in the earlier posting, let us know about what you are curious about with regards to the publishing process, and we’ll try to cover it. And if anyone who has published any book of any kind wants to share her/his experience, contact us! What I didn’t write about at the time was that I had an essay that was just about to be published in a good peer-reviewed journal that I like a lot. I am definitely proud of the final product and had a great experience working with a very professional staff. The best part of the process for me was the initial step of submission, because I felt that I got a fair shake and an objective blind reading–though, of course, I would think that because the essay was accepted! Structural Issues: We all know about the economic problems facing universities, which are acutely felt in the humanities. I’m just guessing here, but I imagine that academic journals are feeling the pinch even more, since their value to administrative types would likely be the prestige they might bestow to a program. Since prestige doesn’t pay the bills and funding is hard to come by for anything, journals have few options, but they probably involve raising subscription rates to university libraries that can’t pay them, cutting staff or at least some of salaries, shuttering up or delaying production. Check out, for instance, the dire situation of well-esteemed minnesota review, which faced substantial cutbacks from an unsympathetic institution, as reported by Marc Bousquet in 2008. (And it looks like they haven’t put out a new issue since 2009.) And I’ve heard that many university presses at venerable schools have cut back on publishing literary criticism, and that was the scuttlebutt *before* the Great Recession, too. Print Fetish: At least in literary fields, there is, understandably enough, a fetish with print and a bordering-on-creepy love for the material object of the book. Even with the proliferation of online research databases with Project Muse and JSTOR, academic publishing in the humanities still privileges this fetish, because digital forms are only viewed as facsimiles of the printed word. While more researching can be done faster, the pace at which research is published doesn’t seem to have picked up, and maybe has even slowed with the structural problems described above. Instead, electronic publishing could be pursued as its own thing these days, rather than as an appendage of the book and printed journal. Though I’m obviously not coming at this from the perspective of an editor and can’t fully appreciate the pressures they face, it’s possible that more content could be distributed via journal websites if they, say, blogged about current topics in the field. For instance, think about how few scholarly articles in literary fields are written about novels published in the last 5 years, which only causes a lag in our knowledge of the most current texts and may only devalue the importance of contemporary literature in the field? Certainly, there are structural and budgetary issues I’m not aware of, but it must be fairly cheap to set up a website to disseminate research, especially when library budgets are tightening up. You might argue that there isn’t enough staff already, but maybe Internet publishing could provide some savings that can be passed along to grad student research assistants to maintain things; if not, maybe a good line on a CV would be enough motivation to volunteer some time? Plus, there are probably a lot of opportunities for real cross-disciplinary work with techie types in trying to produce new websites and interfaces. Old-Fashioned Habits: Yet I think that the difficulties with reimagining publishing as an online medium has as much to do with the habits of scholars as anything else. In short, electronic journals are not considered as legitimate as printed journals with a longer history. I could try to go Benjaminian on this, but academics just seem to distrust research that isn’t anchored to a physical text–even though you’d think skilled, trained readers could sniff out what’s relevant and thoughtful, whether in digital or print form. Plus, there’s a gatekeeping dimension to academia where slow, careful peer review is almost like a necessary hazing ritual. On the contrary, I’d like to think that there’s more demand than capacity when it comes to academic publishing. Recognizing that would not only give younger scholars more career opportunities. Next time, I’ll cover some interesting new projects (referred to me by actual readers) that are attempting to reimagine what is possible for academic publishing online. Subscribe to comments with RSS	or TrackBack to 'Academic publishing: What’s the delay?'. Embracing electronic formats would be smart for any graduate student. If grad student assistants could be hired to maintain sites, they would also develop some important job skills that could be useful whether they stay in the academy or not. That picture is awesome. 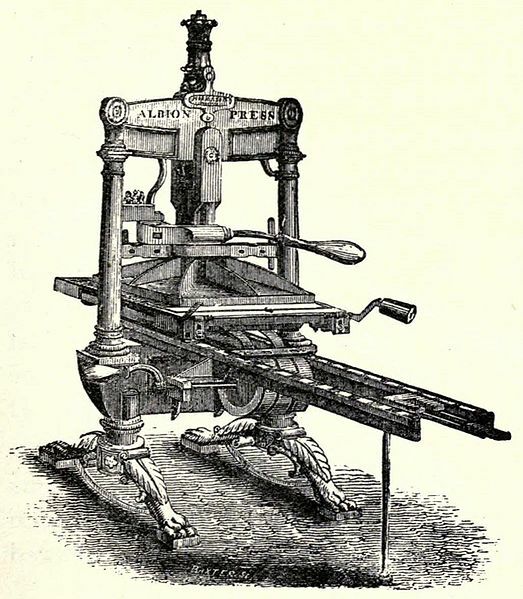 It looks like a combo press/torture device! It certainly sums up the current state of publishing.